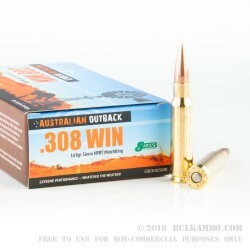 A cheap price for a compelling .308 load from Australian manufacturer Australian Outback an otherwise not well-known brand in the USA. 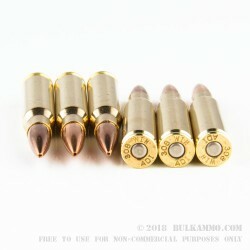 The defining factor for value here though, is that the company is utilizing the Sierra Match King boat tail hollow point projectile to tip their .308 168 grain cartridge. It speaks volumes on their desire to make an impact in the American shooting market. Sierra Match King is a proven entity here in the States, and the credibility it extends to a partner brand is extensive. 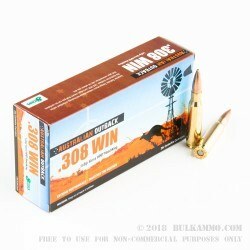 The large variety of tough animals in the Australian Outback is also a ringing endorsement for the manufacturer as the .308 is used for game hunting there by Aussies who know a thing or two about taming the wild. A 2790 velocity makes this a fairly decent round in the .308 Winchester cartridge and all but ensures it will be able to function in most weapons. A boxer primer and a Brass cartridge case round out what legitimately seems like a blatant attempt at winning over the American shooting public. 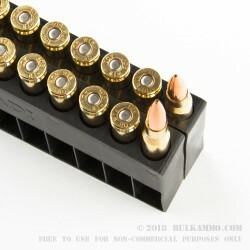 Offer a distinctly “American” cartridge, with a proven American made bullet; and make it reloadable to US standards, all while offering a decent price relative to competitors. If there is one thing we like, it’s great imports for a good price in America.